Back in January of 2015, MP Silva, an international media rights company based in London signed a lucrative deal with Football Kenya Federation (FKF). The deal was worth Ksh 270 million per year to FKF. 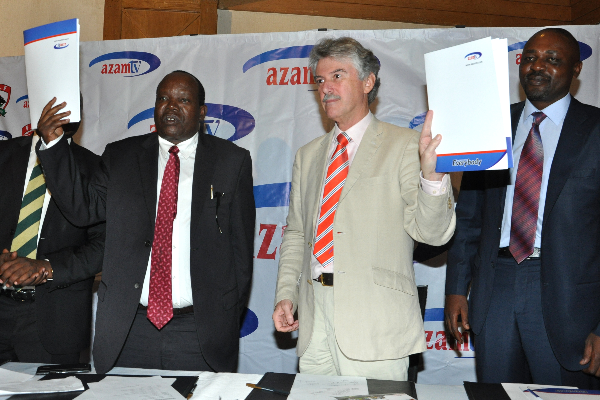 It is the kind of deal that has never been signed by any Kenyan sports league or club. FKF were ecstatic and Sam Nyamweya announced that this was the happiest day of his life. The deal was announced during the period when FKF was wrangling with Kenya Premier League clubs to determine whether FKF would run the local league or whether it would continue to be run by clubs as is the case currently. Naturally, KPL clubs want to control their own destiny while FKF officials want access to the massive amounts of money on offer from MP Silva. Indeed the entry of MP Silva with a gigantic deal for FKF is likely what caused the latest round of wrangles between FKF and KPL as each side wrestled for control of broadcast money. MP Silva have now pulled out of the deal citing dissatisfaction with the quality of the FKF Premier League and the fact that one of Kenya’s two biggest clubs, presumably Gor Mahia or AFC Leopards is not part of the league as had been assured. MP Silva are also raising concerns of an apparent discrepancy in the contracts sent in soft and hard copies and wants it explained while it is also perturbed that no local Free to Air operator has been convinced to take up the role of broadcasting the FKF PL. A third issue raised by MP Silva is the ambiguity of their broadcast arrangement for Harambee Stars and the GoTV shield. Did MP Silva try to muscle in? One can state with a measure of confidence that MP Silva knew that KPL teams had a standing contract with Supersport. Why then did they use the back door to try and muscle their way into getting broadcasting rights for the top Kenyan league. One would think they would try and open up discussions with the KPL and offer a better deal to KPL clubs than the one offered by Supersport. This would have been better than going to FKF and using the FKF to try and muscle their way in. If MP Silva had done any basic research on the internet they would have found out that the current crop of leaders at FKF, namely Sam Nyamweya and Robert Asembo have a history of to put it mildly “lack of accountability”. It therefore comes as no surprise to anyone that FKF would forge documents as alleged by MP Silva, nor should it surprise anyone that FKF would make promises they are unable to meet. A company of MP Silva’s calibre should have done their homework prior to entering into business with FKF. That is unless they got into business with FKF precisely because they lack transparency. That might explain why they would simply give millions of shillings to FKF officials without demanding a measure of accountability. This entry was posted in Kenya Football News and Commentary, Kenya Sports news and commentary and tagged FKF, Kenya Football, mp silva, sam Nyamweya. Bookmark the permalink. Nyamweya and Asembo are a pain in the neck of Kenyan Football. It is good that elections are just at the corner. Any football minded Kenyan should never think of casting a vote for them. May they leave our football in peace. We are tired of them and their unlawful acts that have killed our best sport.